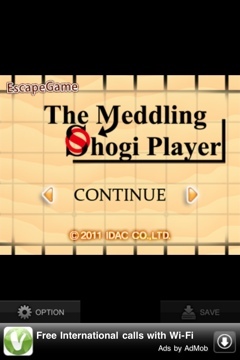 Escape Game: “The Meddling Shogi Player”: A challenging, but ultimately satisfying room escape game. “The Meddling Shogi” is one of IDAC’s more challenging games, and not because of bad game mechanics. The puzzles themselves are tough, but possible to figure out. If you need help, see my walkthrough. 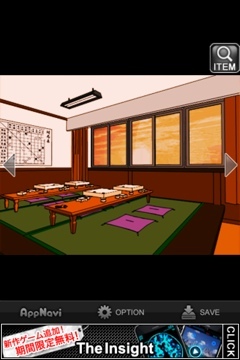 “The Meddling Shogi Player” is a room escape game, with the usual controls. You flick around the room to explore your surroundings and look for objects. You need to use the objects and clues to find to solve the puzzles and escape the room. Like most IDAC games, you need zoom in on all the clues so the game registers that you saw them before you can use them. This can lead to some frustration if you’re not used to it. But if you’ve played IDAC games before, it shouldn’t cause you too much grief. Just tap tap tap as much as you can! The story is not nearly as interesting as the puzzles. Basically, you fell asleep while the club was open and got locked in. Nothing too exciting. Nonetheless, you need to escape. The 2D graphics are very simple and not nearly as impressive as IDAC’s 3D games like “Strange House” and “Snow White.” But the items are clear and there’s no confusion about what you’re looking at. Like most IDAC games, there’s no music here. Also, the sound effects are just the typewriter noises you get from the on-screen text. Once you escape the room, there isn’t much reason to play again. There are no alternate endings. “The Meddling Shogi Player” is one of IDAC’s most challenging escape games, but the puzzles (for the most part) make sense. It can be frustrating at times, but it is possible to complete it by following the clues. If you need any help, refer to my Meddling Shogi Walkthrough. If you liked this game, try Escape Game: “A Cold and Deserted House”, Ellie – Help me out…please, and Diamond Penthouse Escape 2. Have you ever thought about writing an e-book or guest authoring on other sites? I have a blog centered on the same topics you discuss and would really like to have you share some stories/information. I know my visitors would enjoy your work. If you are even remotely interested, feel free to send me an email. Thank you for your well-done site. Your reviews are a pleasure to read and your site is aesthetically pleasing. What is this font? I love it. The font in your comment box is the one I love. The comments are in a different font.